A képre történő kattintás után megtekinthet minden rendelkezésre álló fotót a (az) Studio with Balcony Views over Manchester-hoz. Studio with Balcony Views over Manchester is situated in the Manchester City Centre district of Manchester, 200 metres from The Palace Theatre and 500 metres from Canal Street. The accommodation is a 6-minute walk from Bridgewater Hall. With free WiFi, this apartment features a flat-screen TV and a kitchen with a dishwasher and microwave. The bathroom has a shower, free toiletries and a hair dryer. Manchester Central is 600 metres from the apartment, while G-MEX Centre is 600 metres from the property. 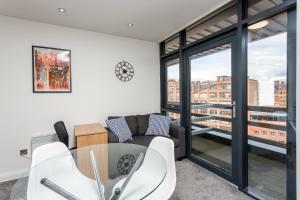 The nearest airport is Manchester Airport, 13 km from Studio with Balcony Views over Manchester. Please note the lead guest must be 21 years and older. Arrival outside the stated check-in times, will incur a fee. A security deposit of 200GBP is charged at the time of booking and is refundable subject to damage checks. Please inform Studio with Balcony Views over Manchester in advance of your expected arrival time. You can use the Special Requests box when booking, or contact the property directly with the contact details provided in your confirmation. Guests are required to show a photo identification and credit card upon check-in. Please note that all Special Requests are subject to availability and additional charges may apply. A damage deposit of GBP 200 is required when you book. This will be collected by credit card. You should be reimbursed within 7 days of check-out. Your deposit will be refunded in full via credit card, subject to an inspection of the property.